﻿ Bayern Munich 0-1 Real Madrid. All set for the new season! 03.08.2016 » Bayern Munich 0-1 Real Madrid. All set for the new season! 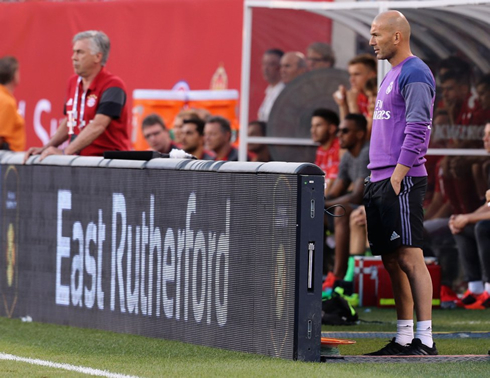 Real Madrid have wrapped up their US pre-season tour with a win, after beating Bayern Munich 1-0 at the MetLife Stadium. Danilo scored the only goal in this game and the Merengues can now start preparing next week's UEFA Super Cup final against Sevilla. The level of the opponents picked out for this year's pre-season was quite demanding. Nevertheless, Real Madrid wrapped up a second win out of 3 games in their US tour, this time by defeating Bayern Munich 1-0 in New Jersey, at the MetLife Stadium. The winning goal was delivered by the Brazilian Danilo, after a strong strike from outside the box deep in the second half. For the Merengues, the real business will start next Tuesday, as they travel to Trondheim in Norway to face Sevilla for the UEFA Super Cup final. Zinedine Zidane has finally had the chance to see a few more of his key players in action this Wednesday night, as Sergio Ramos, Luka Modric and James Rodríguez were all back and straight to starting eleven. On the other hand, Karim Benzema was still spared from this game as he continues to recover from an injury and Gareth Bale will only reunite with his teammates in Madrid, this Friday. Nevertheless and despite having missed all 3 games in this pre-season, both Benzema and Bale may still make it to the UEFA Super Cup final vs Sevilla, scheduled for next Tuesday. Pepe and Cristiano Ronaldo though, are set to miss that game and are only going to return from their vacation break on August 10, precisely one day after that the UEFA Super Cup final. Despite the slow recovery of their star players, Madrid are still odds-on favourites to win the Super Cup given the depth of their resources and the stunning achievements of the team at the end of last season. With key players coming back into the fold right on schedule, Madrid will hit the ground running and add another trophy to their collection. In fact, many enhanced odds offers that usually float at the start of the season have Madrid as one of the top tips to win the Champions League again this year. Now focusing on last night's game in New Jersey, Real Madrid didn't have the best of starts and it would be Carlo Ancelotti's Bayern Munich dictating the rules on the pitch and being the more dangerous side upfront. However and as the game moved on, we entered the second half and the Merengues slowly started to becoming the dominating force. Just like he had done in Madrid's previous games, Zidane's changed most of his players throughout the second half and that clearly turned out to play in their favour, as Bayern limited themselves to only make 3 substitutions. The only goal in this match arrived in the 79th minute, in a stage of the game where most of us were probably already expecting to see both teams going into a penalty shootout. Danilo had different plans in mind though and his audacity paid off when he went all the way on his own on the right side of the pitch, just before cutting inside and blasting a left-footed shot straight into the back of the net. With the 1-0 on the scoredboard and 10 minutes left to be played, Real Madrid would still get close to increase the lead at least a couple more times through this pre-season's sensation Mariano Díaz, but sadly, the Canterano couldn't finish off his chances. Next week there's the trophy of the season on the line, as Real Madrid faces Sevilla in Trondheim for the UEFA Super Cup Final. Cristiano Ronaldo next game for Real Madrid is the UEFA Super Cup Final on August 9 of 2016, against Sevilla. You can watch Juventus live stream, Real Madrid vs Sevilla, Liverpool vs Barcelona, Manchester United vs Leicester City, Viking vs Arsenal, and Sunderland vs Borussia Dortmund, all matches provided from our live sports game pages.